Toronto | GourmanDEE - musings of a gourmand named Dee. If you are want the opportunity to sample over 1500 different wines, spirits and beers along with food from local restaurants and caterers then this is the place for you. The Gourmet Food & Wine Expo is happening November 20 to 23 at the Metro Toronto Convention Centre in Toronto. Along with booths for sampling, the expo features specialty areas like the Mott’s Best Caesar in Town National Competition pavilion, the VIP lounge that features rare premium consignment, vintages and private order wines and a Food Network stage with celebrity chefs (like Lynn Crawford) preparing some mouthwatering dishes. While I’m not a wine connoisseur (yet), I have attended this show for quite a few years as a way to experience some wines I’ve heard of and always wanted to try. I should point out that this is a very BIG show. Over a weekend, about 45,000 people will pass through the show floor so be prepared to patiently wade through a crowd. Thursday was the opening night of the expo, which is also called the VIP night. This is the night where the general public can attend alongside the media, corporate sponsors and industry professionals. You may also have the opportunity to sample some premium items that are only available on this particular evening. Just so you know, I attended as part of the public and bought my own entry and sampling tickets so this is an unbiased review. This year, I opted to be more strategic by looking through the list of exhibitors and consulting the floor plan prior to my visit in order to target specific booths. As I plan to go back to the show on Saturday to sample more goodies, I didn’t rush through this visit. Here are my highlights for Day 1 of the show. Arriving just after six, I felt I needed a bite to eat before I started sampling wine. 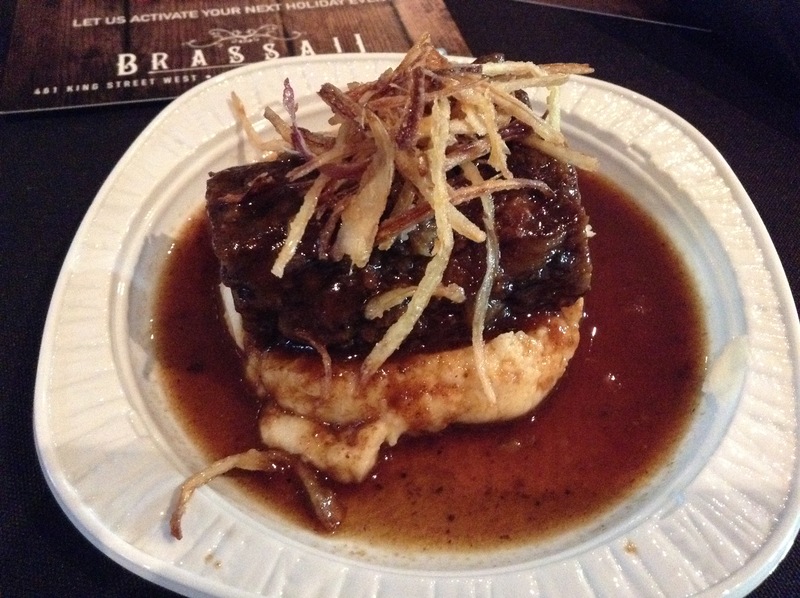 My first stop was Brassaii, who was making a short rib dish. This was excellent and I can honestly say it was almost perfect. The short rib was wonderfully tender with extremely smooth potatoes and flavourful jus. But for me, the shallots (although nice and crispy) were a bit too salty. I checked with two other people chowing down next to me how they felt about this dish and they loved it except for the salty shallots as well. My easy fix was to scrape off the shallots and continue to devour this dish. Definitely worth trying. I love champagne! If you are also a lover of champagne, this is the best place to sample liquid gold without having to fork out the money for an entire bottle. I opted to venture into the VIP lounge to try an award winning rosé champagne made from 50% Pinot Noir, 40% Chardonnay and 10% Pinot Meunier. What a treat! This is a dry champagne with a hint of sweetness that is delicate and just right for my palate. 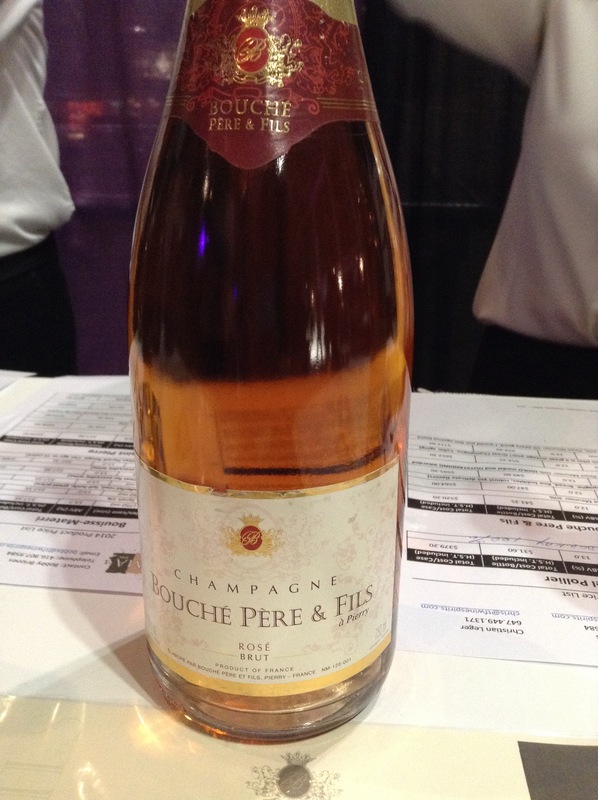 If you fall in love with it, you can order this champagne from the exhibitor in time for the holidays! 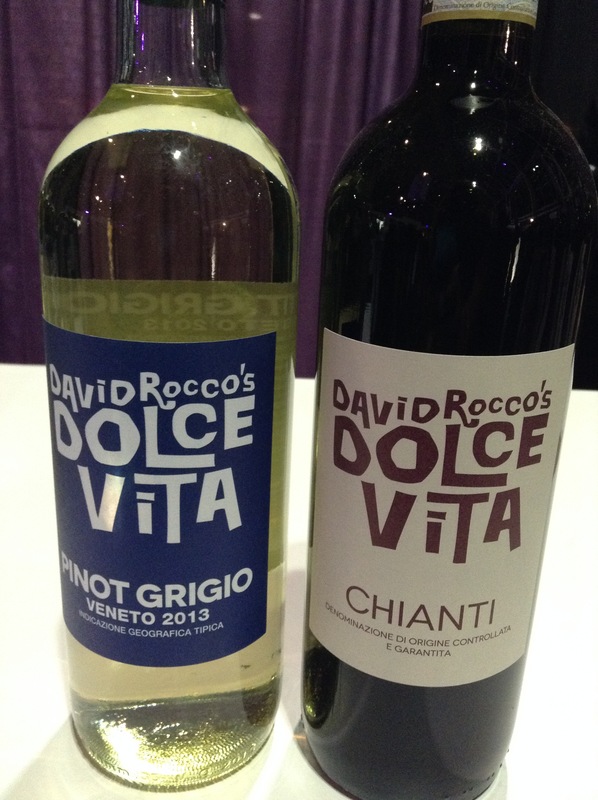 David Rocco’s Dolce Vita – Pinot Gricio (L) and Chianti (R). Did you know that Chef David Rocco had his own wine? I didn’t either and found out it was only released in the LCBO as of yesterday. There were three bottles to try: Pinot Griogio, Chianti, and a Prosecco (not pictured). I was leaning towards the Chianti but the exhibitor told me that Pinot Grigio was equally as good just different. Well…I’m not a big fan of pinot grigio. Whenever, I’ve had it, I find the finish a bit metallic in my mouth so I avoid them if possible. But being a good salesman, he convinced me to take a tiny sip. The finish was soft and very pleasant. I was surprised that I really liked it and have decided it will be worth getting a bottle to explore this at a future date. Pinot Grigio may be redeemed in my eyes with this bottle. I moved on to try the Chianti. This wine blend of sangiovese and merlot grapes was pleasant and I though would be a great sipping wine. Might be a great addition to your next wine and cheese party? I did a double take when I saw someone walking by with this. Then when I found the booth I was pleasantly surprised. I thought Magic Oven only made pizza. Apparently, their other offerings are very good as well. 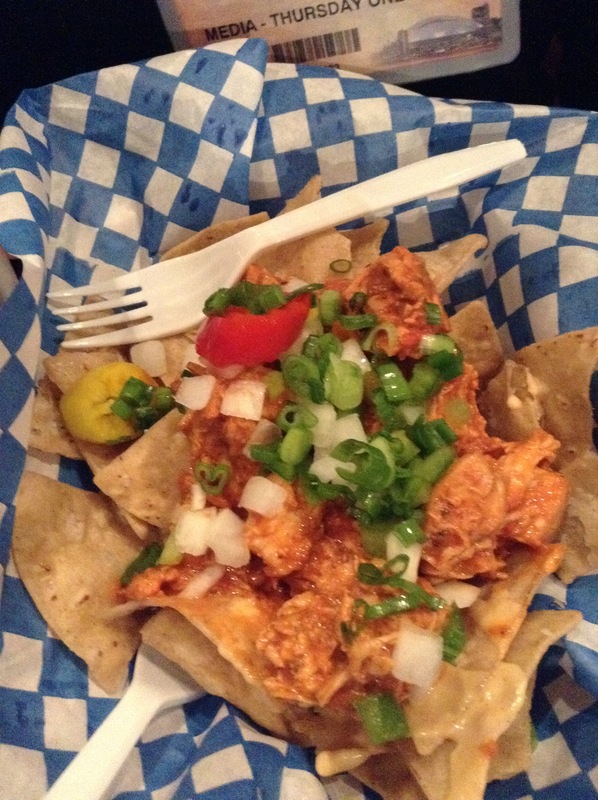 The chicken in the nachos was cooked perfectly with a hint of heat and is a filling dish. You could also request this item without the nachos and they just give you more meat. Bonus! Lately, I’ve been exploring Cabs and I purposely went to the California Wines area to try the Stags Leap Cabernet Sauvignon. At the booth, I starting chatting with the exhibitor to find out what was so great about this wine and what’s up with the price (retails for $50). He agreed that the price is on the higher end but after a taste I will be a believer. Ha! Before he poured the wine, he brought over the Beringer Cabernet Sauvignon. He felt this was another really good Cab at a lower price point (retails for $37.95) and felt I would enjoy them both and add them to my list of favourites. 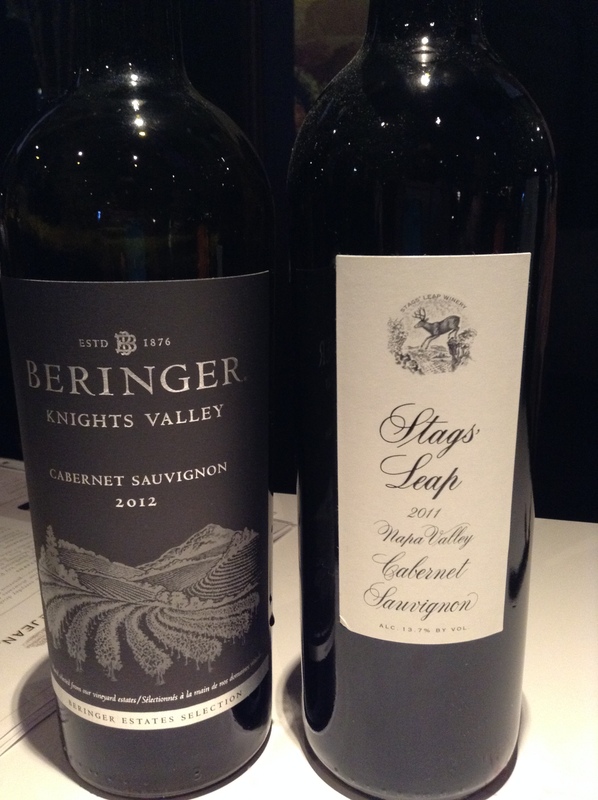 I started with the Beringer and I loved the smell and taste of fruits with a hint of currants. It gets my yummy juices going. I would definitely consider adding this to my table on occasion. But on tasting the Stags Leap, I can only say wow. It is smooth. It’s smooth all the way through until the end. This is the one you you should taste at the show. Yum, yum, yummy wow. When I started chowing down on this lovely dish, I thought this expo has definitely upped its food game! 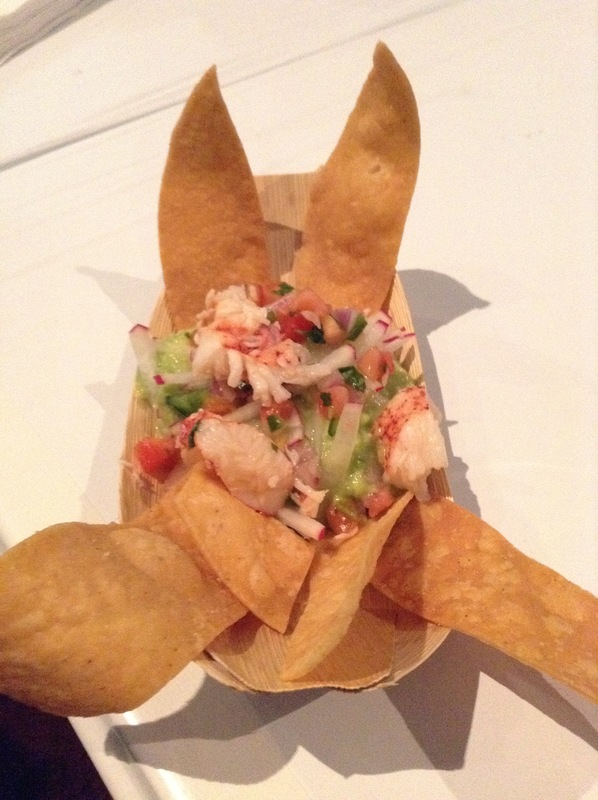 This may look like a small dish but there are alot of chunks of lobster atop a heap of tasty guacamole. It took awhile to finish this thing and I was not complaining. I couldn’t stop laughing when I read the label of this wine and decided to try it just because I think its bold and hilarious. After tasting the wine, I stopped laughing. This blend of Zinfandel, Merlot and Cabernet Sauvignon is an nice drinking wine to curl up with on the couch on Friday night or to have with dinner and will now be added to my list of go to drinking wines at home. Seriously. At $16.95 (LCBO price), it’s quite affordable. I’m glad I was able to learn about some new wines to drink and possibly give as gifts at this show. But there are many more to be tried. Thankfully, there is still time to go back to the Expo this weekend and explore more of the food and drinks so I hope I’ve inspired you to go. Maybe I will see you Saturday at a tutored tasting! You may have heard that Toronto Pearson Airport has revamped its dining options for travelers. Flying out of Terminal 1, I decided to stop at Fetta, a panini bar developed by Chef Mark McEwan but run by OTP Management, an airport food and beverage operator. The menu features a selection of premade sandwiches that are grilled on order and also some entrées and appetizers plus cocktails, wine and beer. 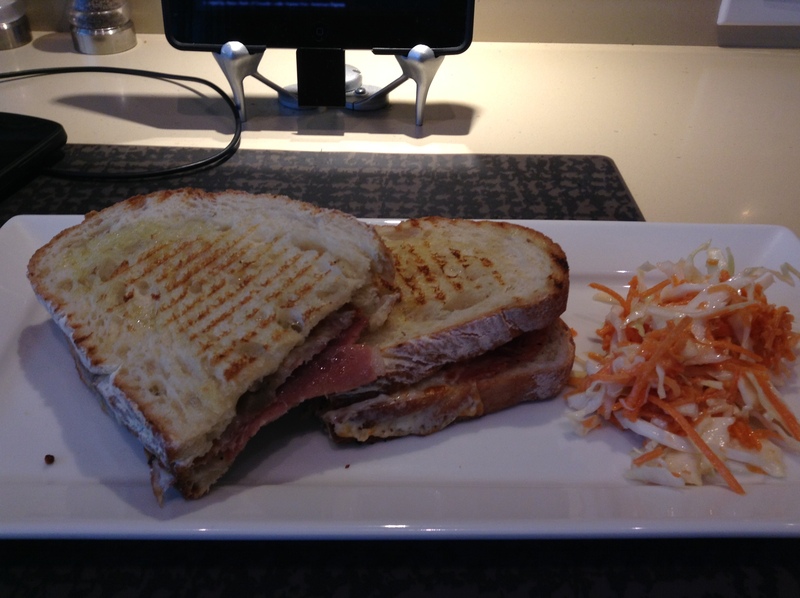 I decided on one of the panini sandwiches so I can bring half on the plane with me. I’ve never enjoyed Air Canada’s meal offerings as noted in my previous post, Mile High Dining. 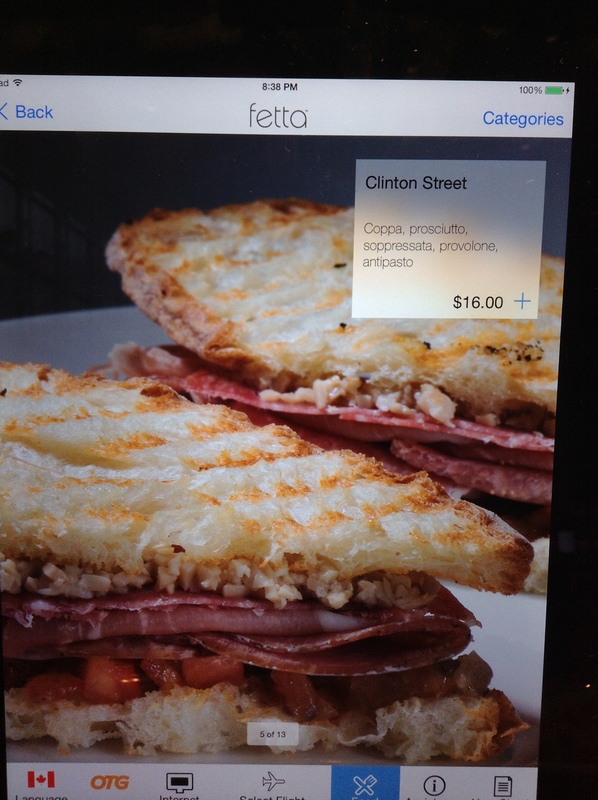 My choice was the Clinton Street panini consisting of coppa, prosciutto, soppressata, provolone and antipasto. On first sight, it seemed rather thin for a $16 sandwich, but this airport dining so I wasn’t shocked by the price tag. 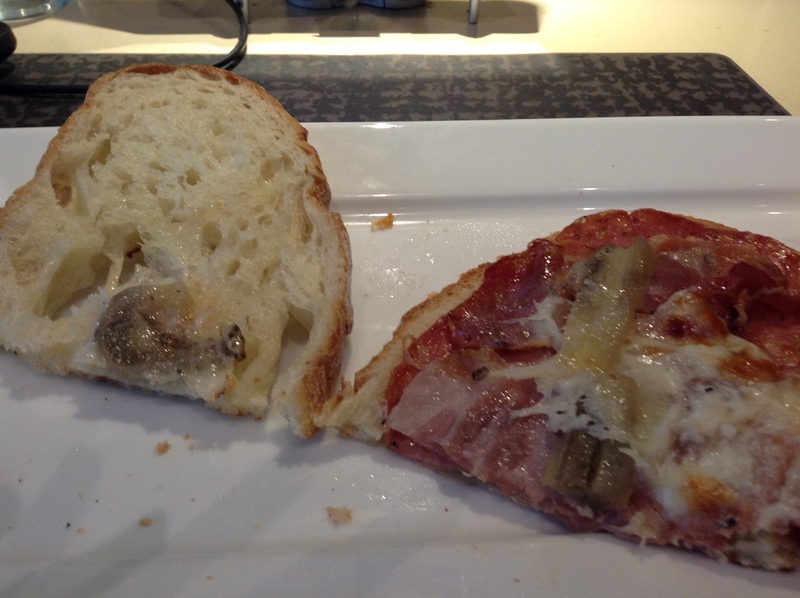 I liked the grilled bread and the slight saltines of the ham but didn’t taste much of the antipasto. I was wondering if they just forgot to add it so I asked the server. He assured me it included antipasto. I decided to open it up to take a look to be sure. A peek inside the sandwich. I was wrong. As you can see there is a bit of antipasto but I honestly thought it came with more. As I was still sitting in front of the convenient iPad that you order from, I looked up the sandwich that I ordered. I see a slight difference between the sandwich I received and the one in this picture, don’t you? I definitely see tomatoes on the bottom. I showed the photo the server and he said that it was just a stock photo. The sandwiches are never served like that. I did like the sandwich and think it is a nice addition to the choices of dining at Pearson but I would appreciate knowing exactly what I ordered especially if there is a picture of it. The area of Harbour/Yonge/Queens Quay near the waterfront is finally reviving. If you live in this area of the downtown core, it’s a bit of a dead zone for socializing. You’re usually heading elsewhere to grab a hot or cold drink and a bite to eat. Finally, a well known name has come to the Harbourfront area. 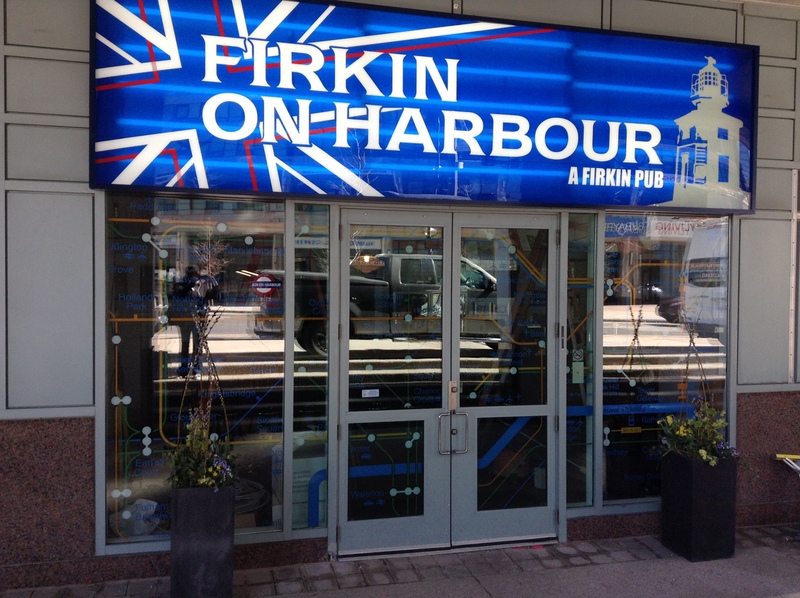 Firkin on Harbour, part of the familiar Firkin Group of Pubs, has leased the space that formerly belonged to Harbour Sports Grille. The grand opening is on April 26th at 4pm, according to their Facebook page. Surrounded by condos, this pub is sure to the local watering hole in this neighbourhood and it also includes an outdoor patio. 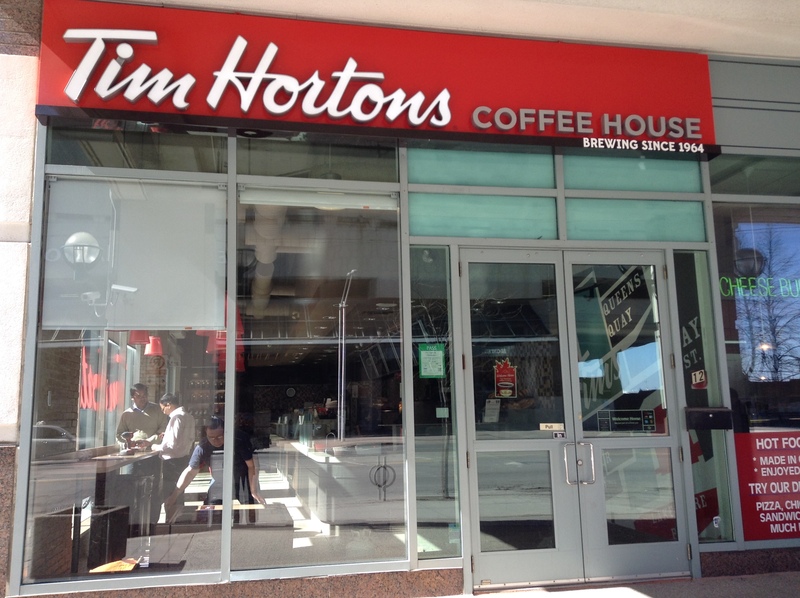 Another newcomer to the area is Tim Hortons. Located at 10 Queens Quay (by Yonge Street), it moved in a few months ago and is doing well because who doesn’t need a Tim’s in the morning. For those of you who aren’t a fan of Timmy’s, you’ll be happy to note that I spied a Starbucks sign at the bottom of The Toronto Star building at Yonge and Queens Quay. 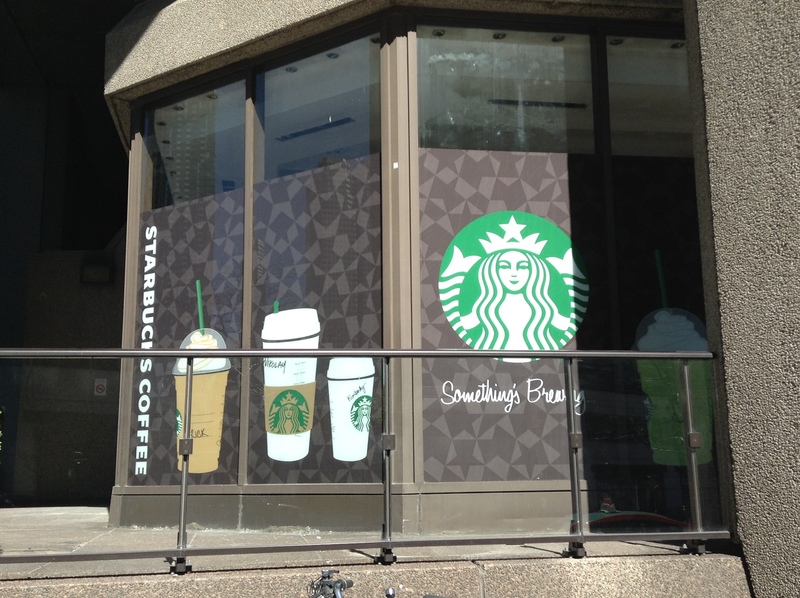 Starbucks at 1 Yonge St.
It’s not quite open yet but it looks like it will be in another week or two. I say to them all, welcome to the neighbourhood! Like many, I love having Sunday brunch. It’s a wonderful ritual to while away your afternoon with family or good friends. But the brunch at the Ritz Carlton hotel in Toronto is not your typical brunch. Served on the upper level at the elegant TOCA restaurant, the variety and quality of the food is stunning. I started with the massive display of oysters, mussels, shrimp, lobster tails and the most amazing smoked trout I’ve ever tasted. Beside that were platters of sushi and ham charcuterie.This all-inclusive feast included unlimited glasses of your choice of prosecco, bellinis or mimosas You could probably have prosseco, bellinis and mimosas. You choose! The salad table has about 5 different options like including grilled asparagus as well as make your own mini salad bar. I also sampled dumplings, a pan fried fish of the day with julienne vegetables and some mini plated items like roast duck. The carving station had a massive beef wellington. It was perfectly cooked, tender, still warm with a flaky pastry. Delicious. At the made to order omelette station, the chef assured me they use real eggs and he was kind enough to add lobster to my order. You can also request eggs any style. TOCA is known for their cheese cave so of course there are a selection of cheeses included but since I’m lactose intolerant I focused on the things I could devour. Not to be forgotten is the fresh croissants and breads with butter and jam for accompaniment. The most amazing area was the room dedicated to desserts. If you can find room you must, must, must have dessert! There is a chocolate fountain, macaroons, chocolate ganache, cheesecake pops and much more! 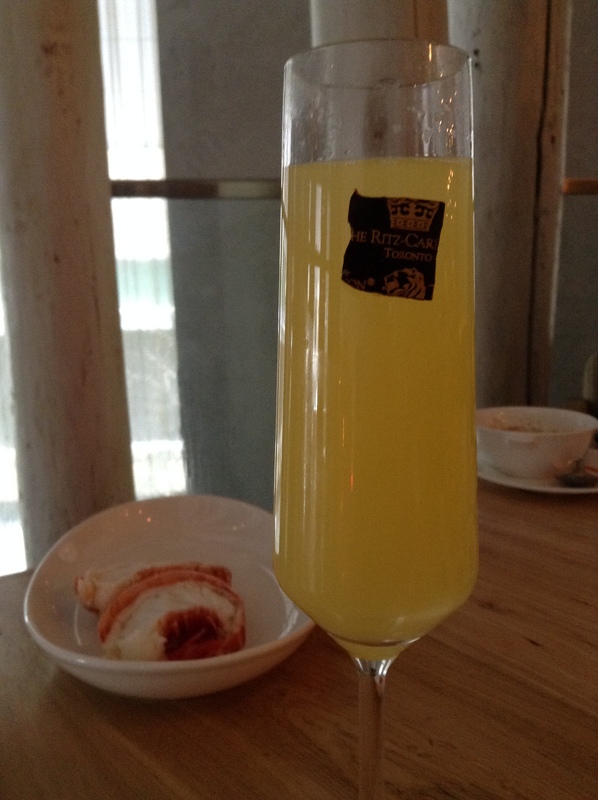 After two hours, I was still drinking mimosas because hey…it’s Sunday. I found the level of service just amazing. Every time I went up to get more food, my glass was refilled (yay! ), my plate was cleared and my napkin folded. The restaurant was full but I never felt over crowded or rushed and the food was always replenished. I order to not detract from an enjoyable experience, I did not take photos every items in the room. For this type of brunch, just let your taste buds lead you and enjoy.